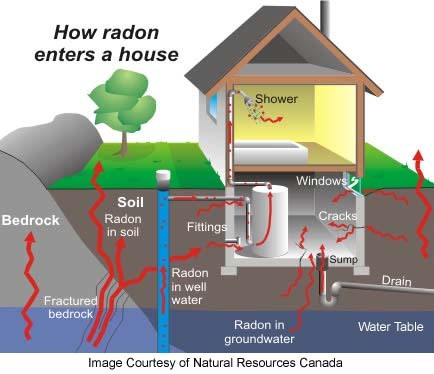 Radon has a half-life of about four daysâ€”half of a given quantity of it breaks down every four days. When radon undergoes radioactive decay, it emits ionizing radiation in the form of alpha particles. It also produces short-lived decay products, often called progeny or daughters, some of which are also radioactive. What is a "working level" (WL)? EPA recommended this mitigation action level in 1986 for several reasons. First, at lower levels (2 pCi/L) measurement devices' false negative errors increase threefold, and false positive errors increase twofold. Secondly, mitigation research indicates that elevated levels can be reduced to 4 pCi/L or less 95% of the time. Research shows that 2 pCi/L can be achieved 70% of the time. Further, today's mitigation technology can reduce radon levels to between 2 and 4 pCi/L most of the time. Finally, cost benefit analysis performed in 1986 indicate that an action level of 4 pCi/L results in a cost of about $700,000 per lung cancer death saved. If the action level was set at 3 pCi/L, the cost would be $1.7 million, and if set at 2 pCi/L, the cost would be $2.4 million per lung cancer death saved. EPA states that 4 pCi/L is a recommended action level, yet homeowners can further reduce their potential lung cancer risk by mitigating homes that are below 4 pCi/L. Click here to go to the Kansas University Radon Fact Sheet page or here to view some of our actual reports.